I love the quality and style of my rice jewelry and receive compliments about the pieces I wear quite frequently. I especially love that its quality and craftsmanship and not like the rice jewelry sold by some other companies. When I compare the prices the pricing is really amazingly low. And there's a huge range of prices in the website, so there's really something for everyone. Because the chain I ordered is real sterling silver, it WILL tarnish over time, just like sterling silver flatware and vases. I keep mine in airtight containers to slow down the process, and use polishing cloth once a while so that I wear a piece to keep it sparkling. 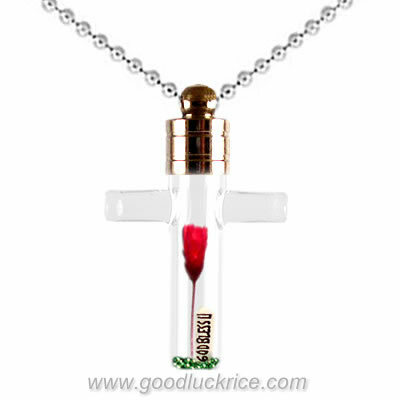 I recommend the same to all Good Luck Rice Jewelry customers. Date Added: 10/26/2014 by Cheryl B.
I love the quality and style of my rice jewelry and receive ..